The Classic TT may have only got underway on 2013 but those four years have seen numerous race winners crowned across the classes which have included the Senior (500cc), Junior (350cc), Lightweight (250cc), Superbike, Formula One and Formula Two. Eight riders have currently taken more than one race win but its Michael Dunlop that leads the way on four wins, his victories coming in the 2013 F1, 2015 Superbike, 2016 Superbike and 2016 Junior races. Riding for Steve Wheatman’s Classic Suzuki team, Dunlop’s F1 and Superbike wins were taken on the 1100cc XR69 replica where he currently holds the lap record at close to an astonishing 127mph. His Junior win came riding a 350cc MV Agusta although the ride was originally earmarked for 2014 Junior race winner and lap record holder Lee Johnston. But when he got injured at the Ulster Grand Prix, Dunlop stepped in and got the better of Michael Rutter after a race long duel. However, he was joined on four wins after the 2018 event when Dean Harrison won the Superbike Classic race for the second successive year. An ever-present at the event, the two wins came after the Bradford rider had already taken victory in the 2013 Formula Classic and 2015 Senior Classic races. 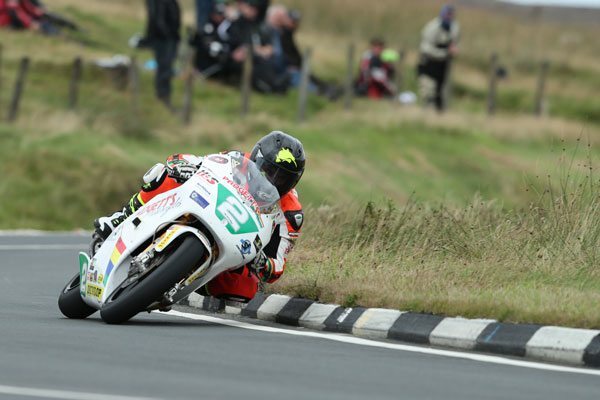 Victory in the 2017 Lightweight race moved Bruce Anstey onto three wins, and it came in record-breaking style as he became the first rider to lap the 37 and ¾-mile Mountain Course at more than 120mph on a 250cc machine after a scintillating lap of 120.475mph. PACEMAKER, BELFAST, 29/8/2016: Michael Dunlop (Black Eagle MV Agusta) celebrates winning the 350cc race at the Classic TT today with runner up Michael Rutter and third placed Alan Oversby. That followed on from his successes in the same race in 2016 and the Formula One race in 2014. He finished second in the latter twice as well, continuing to set records, his lap of 127.496mph on the Padgetts YZR500 Yamaha in the 2017 race the fastest ever lap around the Mountain Course for a two-stroke machine. He’s tied on three wins with Dean Harrison, an ever-present at the event, who took his third victory in the 2017 Superbike race, this following on from his success in the 2013 Formula Classic and 2015 Senior races. Five riders have taken two wins, Chris Palmer taking a brace in 2013 (Junior Classic and Formula Two) and Ian Lougher doing similar in 2014, this time in the Senior and Formula Two races. Michael Rutter joined them on two wins in 2017 when he won the Junior Classic for a second time, having previously won it in 2015 with Lee Johnston doing likewise after adding the 2018 Lightweight race to victory in the 2015 Junior Classic race. Olie Linsdell, Jonathan Cutts, Lee Johnston, Ryan Kneen, John McGuinness and Josh Brookes have all taken a win apiece since 2013. When it comes to podiums at the Classic TT, it’s Bruce Anstey who leads the way on six, the Kiwi having first stood on the podium in 2014, taking third place in the Senior on Ken McIntosh’s Manx Norton. Two days later he grabbed his first win with victory in the F1 race and a year later he took second place in the same race with his fourth podium coming in the 2016 Lightweight race which he led from start to finish. 2017 saw him add two more rostrums to his collection with another win in the Lightweight race and second in the Superbike. He was joined on six podiums in 2018 by two riders, Ian Lougher and Lee Johnston, the former taking a brace of wins in 2014, the Senior and Formula Two, before taking another second place in the 2015 Senior race where he was again riding a 500cc Paton. His fourth podium came in 2016 when he took second place behind Anstey in the Lightweight race and he repeated this result in 2017 for podium number five. This year saw him finish third in the same race to make it six podiums in total. Johnston, meanwhile, took no less than three podiums in 2018 with victory coming in the Lightweight race on the Padgetts Honda usually campaigned by Anstey and a brace of thirds on the Davies Motorsport Honda’s in the Junior and Senior races. Victory had already come in the 2014 Junior race before he followed this up with third in the 2015 Senior and second in the 2017 Junior, all three being taken on MV Agusta machinery. Two riders have taken five podiums, the first of whom is Dean Harrison with four race wins – the 2013 Formula Classic, 2015 Senior and 2017 and 2018 Superbike – and a second place in the 2016 Senior race. Jamie Coward was the other rider to move onto five podiums after the 2018 event and is the first on the list not to have taken a race win. His first podium came in the 2013 Senior when he finished third and he went one better in the same race of 2017, when he set the fastest ever lap of the Mountain Course by a British single cylinder machine. He took another third in the 2017 Junior whilst 2018 saw him finish second once more in both the Senior and Junior races. Next up on four podiums is Michael Dunlop with all four of those being race wins, three on an 1100cc XR69 Suzuki and one on a 350cc MV Agusta. Michael Rutter also has four podiums to his name, all of them coming since 2015. He’s taken two victories in the Junior class, in 2015 and 2017, with a second place in 2016 whilst second was also the end result in the 2016 Superbike race. He also ‘finished’ on the podium in the 2017 Lightweight but was later disqualified from second place due to an oversized fuel tank. The late William Dunlop follows on three podiums, taking a brace in the Senior class, in 2013 and 2017, and another in the 2016 Superbike race whilst no less than eight riders have taken two podiums thus far with Chris Palmer taking two wins in the inaugural 2013 event before retiring from racing. Dan Cooper took second in the 2013 Junior and 2014 Senior races and has been unlucky not to have won a race so far with the late James Cowton’s runner up positions both coming on a 250cc Yamaha. Ryan Kneen took a good third in the 2013 F1 race on an OW01 Yamaha before showing his versatility with victory in the 2015 F2 race where he just got the better of Cowton. 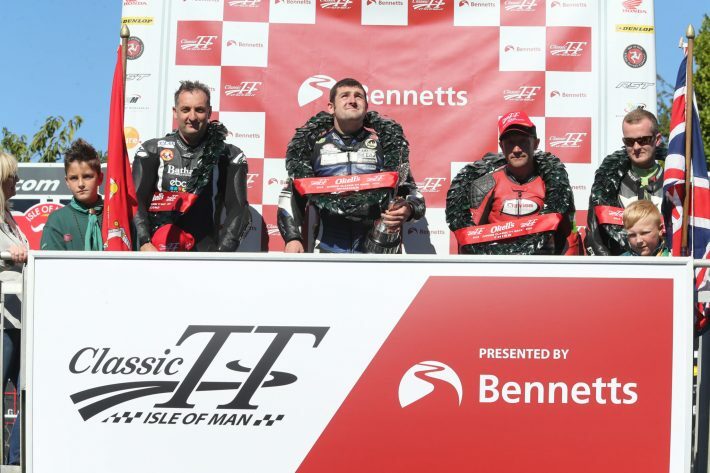 John McGuinness followed up his 2016 Senior Classic race win with victory in the same race in 2018 for his second podium whilst the other double podium finishers have yet to take a win, these being Alan Oversby who claimed second and third in the 2014 and 2016 Junior races respectively, and Phil McGurk who also has a second and third to his name in the 2013 Formula Two and 2015 Junior races. Conor Cummins is alongside them after taking second in the 2013 Superbike Classic race and third in 2018. Despite the event only having been running for five years, an additional twenty three riders have taken a single podium apiece which is perhaps an indication of the fickle nature of the older machines and how just finishing is an achievement!